Huu-ay-aht treasures are one step closer to being home. They arrived in Port Alberni today in early afternoon to be revealed at the Huu-ay-aht People’s Assembly this weekend. The Nuu-chah-nulth Tribal Council’s Quu’asa (Mental Health) department commemorated Orange Shirt Day Sept 30, 2016 and remembered the legacy of the residential school system. The 2016 Tic-Kaa ii-Kwink (Northern Region Summer Games) was hosted by Kyuquot/Checlesaht First Nations during a weekend of glorious summer weather that saw families enjoy three days of sports, socializing and culture. In a ceremony held on the beach at Esowista Aug. 10, the Tla-o-qui-aht First Nation honoured their newest babies and their parents. The parents and the little ones were introduced to the community. Then Thlyik Carol Frank wrapped the babies in shawls that she had made. Held Aug. 10 thru Aug. 14, 2016 in Port Alberni, B.C. Nuu-chah-nulth kids and adults enjoy track and field, lacrosse, basketball, canoe racing, culture, lahal, language treasure hunt, slo-pitch and fastball. On Aug. 3, 2016, the Nuu-chah-nulth Tribal Council's Family and Child Services department, Usma, took the children in their care, who are connected to Hesquiaht First Nation families, to their home of Hesquiaht. On June 8, Joe Martin of Tla-o-qui-aht gave a step-by-step demonstration on how to make tlup-chus (traditional barbecue salmon). Step one, he said, is to start with a fresh salmon like the one he caught that morning. Your knife must be sharp. This is the fith annual Paddle Days hosted by the Ditidaht First Nation. More than 160 kids took part, said Peter Amos, from 5 schools. Students and staff of Zeballos Elementary Secondary School greeted hundreds of guests that honoured their invitation to take part in their school potlatch. Young Nuu-chah-nulth people and their chaperones poured into Nanaimo Entertainment Centre for three days of fun and learning at the Nuu-chah-nulth Youth Gathering. The theme was yaa?akuks suw’a or ‘I love you’ in the language of the Nuu-chah-nulth-aht. 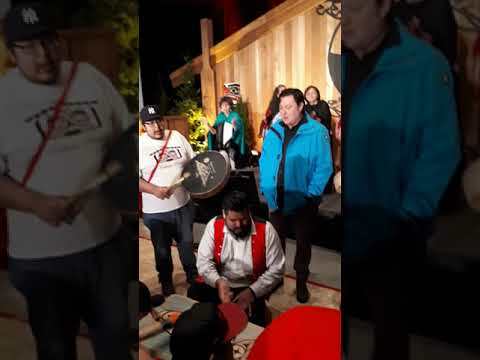 Charlie family gathered at the Esquimalt Longhouse on Nov. 28 to witness an historic event; the transfer of a chieftainship from father to son. Chief Edgar Charlie transfers chieftainship to Nate Charlie. Ditidaht’s fourth annual TRC Paddle Days June 10 and June 11 was a fun-filled event, with five schools and 130 visitors to the remote First Nation community taking part. On April 25, a Coming of Age potlatch was hosted in Ahousaht by Star and Paul Frank Jr. for their daughters Sierra and Mariela. Photography Melody Charlie documented the important event for Ha-Shilth-Sa. Her photos are seen in this gallery. In Hupacasath, among other places on Feb. 3; In Tseshaht for the unveiling of a new subdivision street sign on Feb. 2; and in Ahousaht on Feb. 1. Wolves (red) vs Mulaqw; Stealerz 99 (grey) vs. Hawks 82 Saturday, Jan. 17 at Athletic Hall. On Nov. 1 at Maht Mahs gym, Nuu-chah-nulth Ha’wiih, Chiefs, fishers, members and staff gathered to celebrate the final legal determination of Nuu-chah-nulth fishing rights. The family and friends of late Elsie Robinson came together on Saturday to celebrate a life filled with love, teachings and memories. The Beban Park Auditorium in Nanaimo was filled with hundreds of people for the event. Chief Dennis John and family welcomed hundreds of guests over the first weekend of October as they paid tribute to the memories of his late father, Kelly John, and his brother Edward John and niece Arlene Titian. On Sept. 27, the Nicolaye family dried their tears to end their mourning period. The event was held at Thunderbird Hall in Campbell River. The afternoon began with the ceremonial cleansing of the floor and the family business that ended their grief. 2014 Northern Region Games held in Zeballos Aug. 5 to 9.